What is a wall? Is it just the brick wall or a fence at the end of the garden or something else? We are surrounded by walls, walls to keep us safe like the Thames barrier, or to keep others out or in like The Tower of London. Then there are the walls of culture, religion, and language that may divide us or bring us together. Once we start to think about walls we start to see how they can and do affect our lives and who we are. 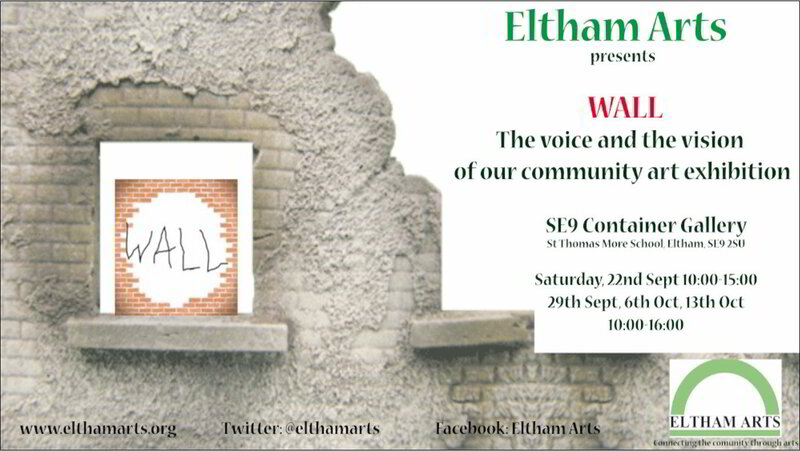 Eltham Arts invites you to look and think about the walls that may surround you, acknowledge them and express your views through a creative form. It can be music, writing, visual art, craft, theatre, digital, painting, collage or any other creative form. It is Eltham Arts fifth anniversary and it is perhaps fitting that this project is perhaps the most ambitious that we have undertaken. It aimed to be an opportunity for all members of our community, individuals , schools, or groups to join in with a project which encourages imaginative and creative thinking. It is about our response to the walls that we build both physically, culturally and mentally. It is about the materials and textures of the walls around us. It's about the past, present, and future, wherever we are from, or it could be about our relationship with the materials that make the world around us. In exploring through Art what walls are and what they do we can gain insights to the world we live in and the community of which we are a part. It didn't matter if they were professional artist what mattered was joining together to create an expression of our community. We asked the community to come forward with ideas and this is the result. Pragya is a collage artist and is exploring the theme Wall through a series of visual arts workshops. She is inviting members of the community to address the walls around them by designing their own bricks for an art installation. The project is led by Gaynor Wingham and Miriam Storey. 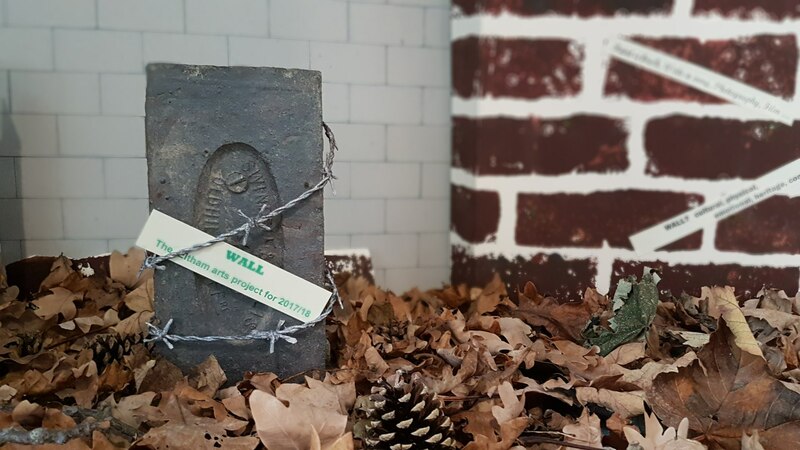 It is a creative writing challange which encourages members of the community to take up a short story or poetry writing challenge to reflect their views about walls they acknowledge around them. The challenge is open for all age groups and we are accepting entries until end of February 2018. Prizes and awards will be presented at a celebration on World book Night at Eltham Library. The winning entries will be complied and published into a book. The project is led by Zahira al Zahira and Dave Kenningham. They are inviting song writers/performers, young or old, to write and perform a song on our wall project theme. The participants will have an opportunity to perform the song in Eltham Music Festival in July 2018. There is also a possibility of producing a CD of selected songs. Robert Piwko and Gaynor Wingham are working together to capture every creative aspect of Wall project and turn it into a documentary. The film will be shown as a part of the art installation in SE9 Gallery. The theme is represented by few photographers who are exploring the theme. Wall: The structure of existance - Photographer Sandra Marques is working on a botanical wall project. She is exploring the cellular structure of plants and the importance of walls in a plant’s life. My Wall – Photographer Elisabeth Isitor aims to capture stories of local people by taking pictures of them against walls. Connecting Walls – Photographer Robert Piwko is working on a series of photographs puzzled together to create a story. A selection of photographs from the above projects will be exhibited at Gerald Moor Gallery in Feb 2019. Songs Across the Walls - Write and perform a song on Wall. Deadline for submissions 31st May 2018. Bricks on the wall - Design your own brick for our community wall. Pick one from Eltham library or make one at our drop in workshops.